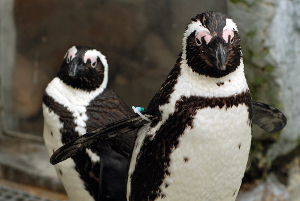 Waddle You Do to Help Endangered African Penguins? Run 5K? Walk 3k? Donate? Whatever you do, you can be a CHAMPION for African Penguins! The African penguin, while one of the most popular species at Mystic Aquarium, is also at the highest risk of extinction. The wild population of African penguins has declined by 70% over the past 10 years. Together we can help prevent this devastating trend. We can educate and engage students and their families to the importance of endangered species and, more importantly, we can all work together to protect them. Receive a $7 per person discount when you sign up with 10 or more runners and walkers. The discount will appear automatically. Raise $100* and receive a basic Animal Parent adoption kit. Raise $500* and receive a special Animal Parent adoption kit. Raise $1,000* and receive a private Penguin Encounter program for up to six people. Raise $2,500* and receive a Penguin meet and greet for up to four guests PLUS a private penguin painting session. Raise $5,000* and receive a special Penguins Up Close encounter for you and a guest and work side-by-side with a penguin trainer during a feeding session. Includes a group photo at the end. 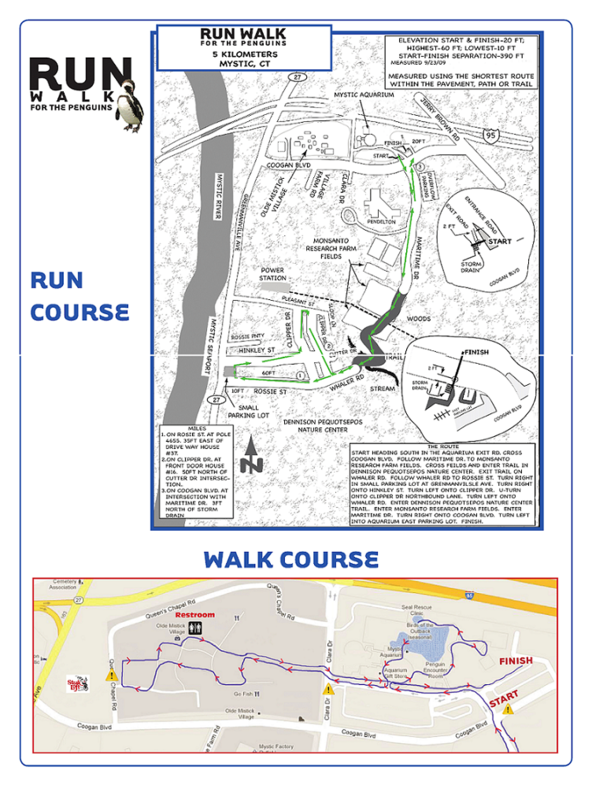 *Fundraising total does not include Run/Walk for the Penguins registration fee. Prizes are for individual fundraising levels. Encounters and special tours are scheduled based on availability. Some restrictions apply. Once you've registered to participate you can create your own customized Fundraising Page! Scroll to the bottom of your account page and look for the $ icon and click on it; that will lead you to set up your fundraising page. Strollers may only be used on the Walk portion. Dogs are welcome, but are not allowed through Aquarium Gates. Dog sitters available from 9:00am – 11:00am. No Registrations will be accepted after 8:45am on Run/Walk day. Pre-Registration will be available on Friday October 19, from 4:30 pm - 6:30 pm. You may also pick up your bibs and t-shirt (if you registered before on or before 9/15/2018) or purchase your t-shirt that night as well. On Race Day Registration will open at 7:30 am and closes at 8:45 am. Be sure to pick up an event schedule to take part in all the exciting race day activities for Saturday! All entries must be signed by the athlete (parent or guardian of athletes under 18) in agreement of the following: I hereby release Sea Research Foundation d/b/a/ Mystic Aquarium, and Ocean Blue Catering, the Town of Stonington, the sponsors and the officials of the Run for the Penguins 5K, Walk and Kid’s race to be held on October 20, 2018 from all damages or injuries incurred during or arising out of the above participation of the individuals named above in this event. I further agree that the above and its nominees and assigns may use, in their sole discretion, the likeness and / or photography taken of me or any reproduction thereof, in any form, style or color, together with any writing and other advertising material, in connection therewith, including television and including, but not limited to, the use of my name and / or quotations. This consent and release is given without limitation upon, or liability for, any use for advertising, illustration, publication, broadcast of every kind, or in trade or media, or for any purpose for promotion by Mystic Aquarium and its nominees. I further agree that such photography and / or likeness, and the film, tape, plates, and negatives thereof, shall be and remain the exclusive property of Mystic Aquarium. I further waive any right to inspect or approve the commercial, advertising or publicity material. I also certify that the individual named above am in sufficient physical condition to participate in this event.